SEOUL, Aug. 28 (Yonhap) — South Korea said Tuesday it will expand the inter-Korean cooperation fund 14.3 percent on-year to 1.1 trillion won (US$990 million) in 2019, reflecting the recent peace mood highlighted by the April 27 summit deal. 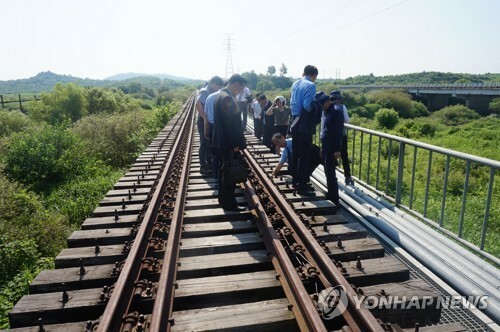 Especially, the budgets for cross-border projects such as the modernization of the North’s roads and railways will sharply increase to 504 billion won, up 46 percent from 344.6 billion this year, according to a scheme approved by the Cabinet that also requires the National Assembly’s consent. The use of taxpayers’ money, however, will depend on progress in denuclearization efforts and consultations with the U.S. and other members of the United Nations on sanctions against Pyongyang. Next year’s budgets for the Ministry of Unification, which handles inter-Korean affairs, total 1.3 trillion won. The ministry has earmarked 1.1 trillion won for the South-North Cooperation Fund, versus 962.4 billion won in 2018. The increase is meant to help implement the Panmunjom Declaration, which calls for the promotion of “balanced economic growth and co-prosperity” of the peninsula. As a first step, the two sides agreed to adopt practical steps towards the connection and modernization of railways and roads between them. A joint survey of relevant facilities is underway. “In case of projects related to sanctions on North Korea, we plan to push for them after creating conditions down the road in accordance with progress in discussions on denuclearization,” a ministry official said. The ministry almost tripled the budget for the reunion of families split by the Korean War to 33.6 billion won. Meanwhile, the Ministry of Foreign Affairs announced that it has proposed a 3.9 percent rise for its budget to 2.3 trillion won. The ministry said it has placed a focus on strengthening cooperation with major foreign countries for the complete denuclearization of Korea and the establishment of peace and bolstering efforts to protect the country’s nationals from possible accidents and incidents abroad. In line with the Moon Jae-in administration’s New Southern Policy, it plans to increase spending to help cement ties with ASEAN and other South Asian nations from 1.6 billion won to 2.2 billion won. The ministry also seeks to increase the official development assistance (ODA) budget by 32 billion won to 1.26 trillion won.